A game of uncontrollable multiplayer chaos that's best played with friends. A fun take on a classic format, great to play with friends—hectic and unique, but easy to understand and play. What is it? Local multiplayer capture the flag, but with religion instead of flags. First I deflected an exploding pie, watching it arc back and fly into my enemy. Then I grabbed a giant cat head and ran across the arena. Suddenly, the cat decided she didn’t like to be carried and my controls were reversed. As a last ditch effort to score a point, I tossed the head to my teammate, who was immediately stabbed to death by another player. Oh My Godheads is a fast-paced couch multiplayer game that has you trying to capture giant heads who all have their own personalities. At the same time you're destroying your friends with glee, a sword to the face, and maybe a bomb-pie. There are five different modes you can play, each with their own unique twists. ‘Capture the Head’, for example, is much like capture the flag—if the flag was a head that resented your constant handling and sometimes fought back. Godheads are temperamental and all have their own unique abilities and quirks. The gods aren't predictable at first, but you begin to see patterns in each one. Gaia is the mother of Earth—a hulking and heavy godhead who will slow you down as you carry her around. The good news is that she can be tossed onto an enemy to crush them. I found this particularly fun, at least when I managed to avoid being crushed myself. Bastet is a giant cat-head who gets angry when you jump, freezing you in place while she meows and sometimes reversing your controls. Agyo also shares a hatred for being held (like most of the heads) and will detonate if you try running around with him in your arms. If you're cunning though, you might be able to use him as a timed bomb, flinging Agyo at enemies before he explodes and ensuring they die along with the head. Zeus will charge up his electricity while being held and eventually blast the area around the player carrying him—however, unlike Agyo, Zeus does not destroy himself in the process. The godheads are of course the central feature of Oh My Godheads and each one has their own matching environment. These island-like maps also present their own challenges. Some maps force you to carry heavy godheads up ramps, while others provide plenty of places you can fall off the map or toss the head off it completely. No matter which map you choose, you'll mostly be picking up heads and bringing them back to the goals. This may sound easy, but with the different gods' abilities it becomes quite the challenge. It feels frantic and fun, especially when packed full of your friends. Not only that, but it’s fast—rounds finish and enemies die faster than you can watch the screen. 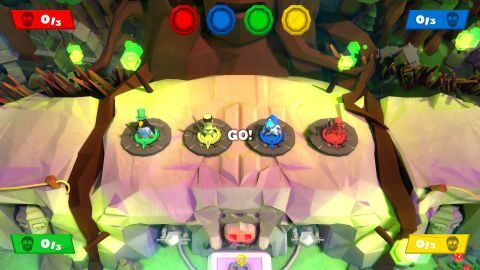 ‘King of the Head’, my favorite mode, challenges you (or your team-mates) with attempting to hold onto a disgruntled god as long as you can, filling up a bar to bring your team to victory. Some of the other modes don’t even include the heads though, allowing you to fight deathmatches without being distracted by the vengeful deities. There are a variety of characters to choose from as well: low-poly penguins, humans, and even skeletons. If you don’t have any friends to play with there are AIs that you can assign to teams and compete either with or against, though personally I use these bots to round out teams as opposed to playing against them. The bots can do some strange things. If you are playing capture the flag and freeze yourself (or your other teammate) the bots will sit there trying to destroy both of you instead of scoring points or doing anything of benefit. When you are frozen you cannot be killed, so it's just funny to watch. They also sometimes refuse to score, throwing the head back towards your goal, even when near their own. Fighting against them feels like an unfair battle. There is also a trials mode that pits a single player against a multitude of different challenges to teach you how to play and help you hone your skills in order to get an edge up on the competition. This mode is more of a tutorial, a way to really understand and practice the different moves you can perform. You face off against a timer to earn medals, but most of the trials force you to only use one technique to finish their challenge. Multiplayer murder is where it's at, of course. You have a sword to swing, a lunging attack to stab with, and exploding pies to launch squarely into people. Some levels also have power-ups that give you different abilities such as squishing your enemies with Zeus’s foot or freezing them for a few moments. After each point you can take your revenge during a short burst of slow-motion kill time. Though you won’t score any points, you can enjoy taking one last stab at the person who scored against your team during these 10 additional seconds before the pitch resets for you to play the next point. Oh My Godheads is a new take on capture the flag, adding something that's much more interesting to carry from one side of the screen to the other than a boring flag. The variety of twists and tactics really help to keep it fresh and entertaining, because you're not just trying to beat your friends but fighting the ‘flag’ at the same time.